As one of only two Princess Cruises cruise ships built in Japan, it’s not surprising this exotic gem can often be found sailing to the most intriguing destinations abroad. 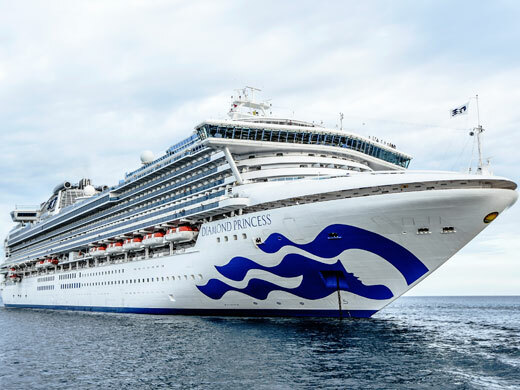 Great-tasting cuisine can be found throughout the ship, including at Princess Cruises popular Italian restaurant, Sabatini’s, where freshly prepared pasta creations reign supreme. In the elegant dining rooms, you’ll find sommeliers to help you enhance your meal with paired wines. Poolside, Princess Cruises hand-tossed pizza is always served to you just out of the oven. And, as an added bonus, both Movies Under the Stars® and The Sanctuary®, a tranquil haven exclusively for adults, have recently been added to Diamond Princess!